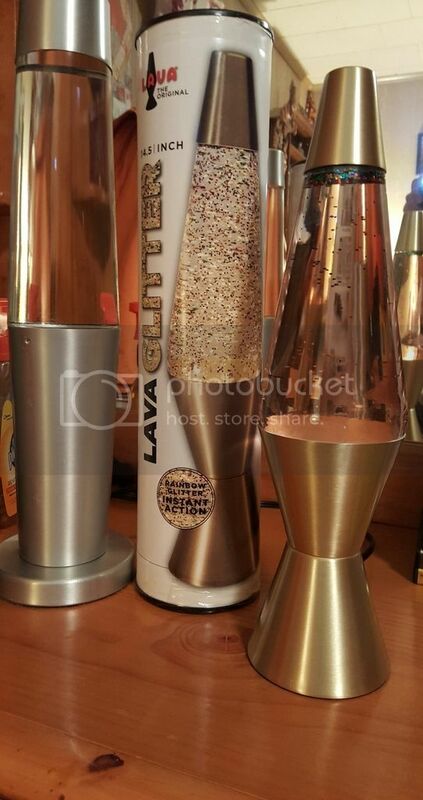 After a season of uneventful store searches, via ebay (gohastings) I was finally able to experience Lava Lite's new old school, heat powered glitter lamp (non/led & non/motorized). The base & lid are very nicely done, like the 50th Anniversary. The fluid is crystal transparent and it works! The glitter is very over populated, twinkles and blinks nicely. Reflecting off walls and seen across the room. 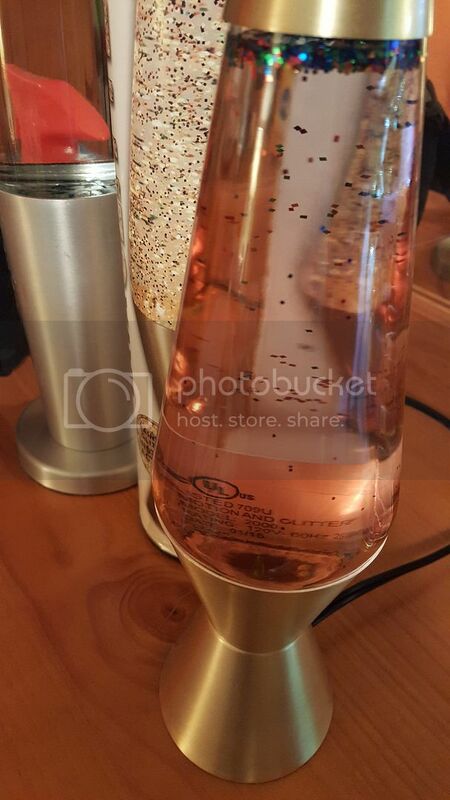 Not sure why they chose to go with a faint peach color to the fluid instead of the advertised clear, perhaps to match the base when turned off? But the colors do shine through indentifiably. Anyway, here it is for anyone (like me) who wanted a better look at these. I saw those on ebay, but thought they were a bit overpriced for the 14 inch. Maybe I was looking at a different listing, but I thought they were like 38.00. I do want one, but was kind of hoping Spencer's would get those in. They look really nice!! I wish they did them in a 52 oz though. I may see if in the future they get so cheap that I can snag a few and transplant into a 52 oz......Looks like a nice lamp though.....nice to know it survived shipping without clouding up. Carol, I have never heard of a glitter lamp clouding up. 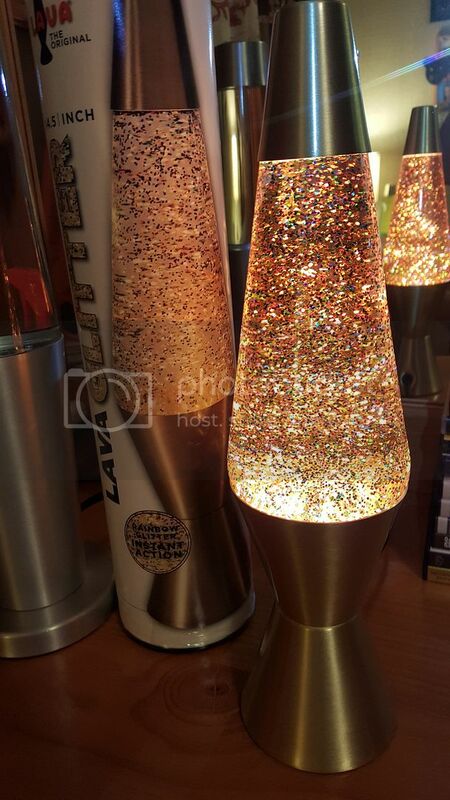 I am about 95% sure that its not possible for a glitter lamp to cloud up. I could be wrong, but I don't see how the liquid would become cloudy. With lavas, the wax is a similar density to the liquid when heated, and if its shaken it will break up into little microscopic blobs that cloud the liquid. However, with glitter, the glitter is not going to dissolve into the liquid. It is always a solid, regardless of temperature, so there is only one liquid in the glitters. OK Ian...makes sense, but you know with LL, anything MIGHT be possible, lol!!! Ye of little faith is me!!! I have a Target about an hour and 15 from me where my spencer's is located, so maybe b4 I make the trip I will give them a call to see if they are in stock and snag one at target. The ones on ebay with shipping are a bit pricey for my budget, especially if I can take a fun run and shop around in Target!!! I would luv to add this addition to my "glitter table". OK, i can do that price!!!!! 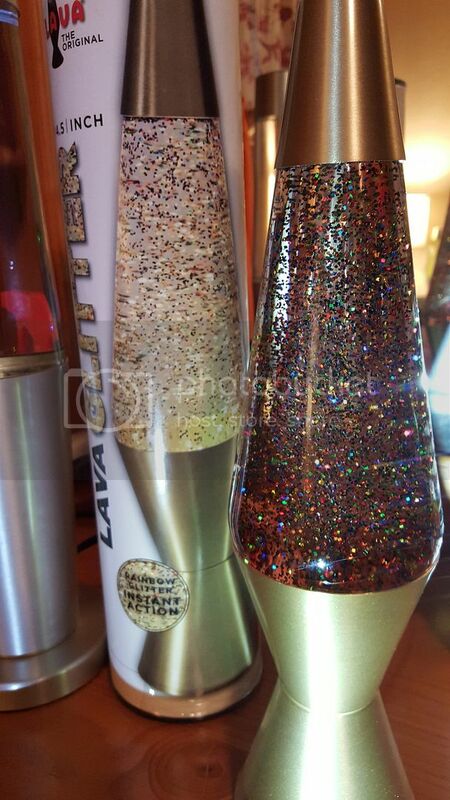 is the lava/glitter in one globe actually going to be a thing?!!?! There was a sticker on mine that said it would be normal for the liquid to yellow over time. Mine took a day or so and the liquid became kinda champagne/yellow colored. I actually returned mine. I was so excited to get this lamp, but when I actually had it, I just didn't end up caring for it. 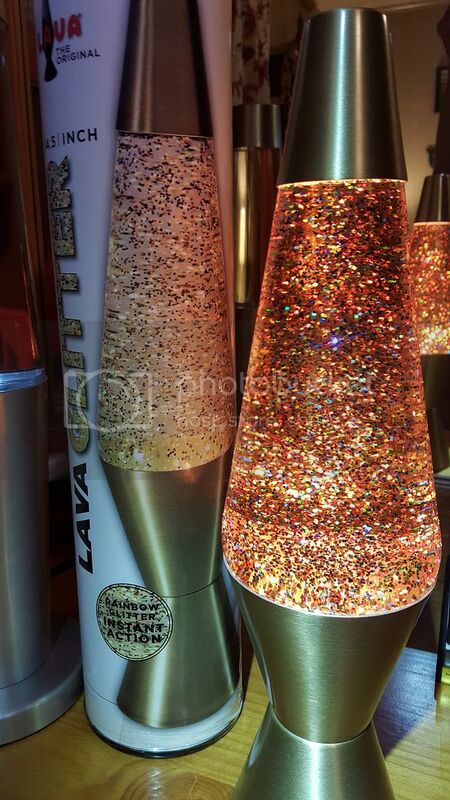 I have actually had a few glitter lamps cloud up. China-made ones. There are flakes in the liquid.